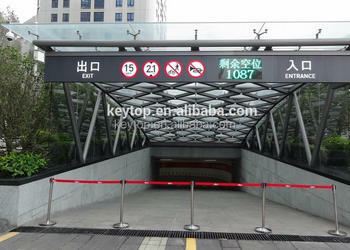 Keytop parking guidance system is suitable for indoor parking garage or multi-level parking construction. on occupancy,drivers are directed to available parking spaces by intersection guidance displays and colour-coded LED lights green for available, red for occupied,blue for disabled placed above every parking bay. LED light,green for free, red for occupied,blue for disabled. will collect and send them to central control unit. 1.No nerve-racking search, stress-free parking. 3.Save fuel and alleviate car wearing. 4.Avoid unnecessary conflict during parking. 4. Allow customers to park in a stress-free environment. 5. Reduce traffic congestion indoor.